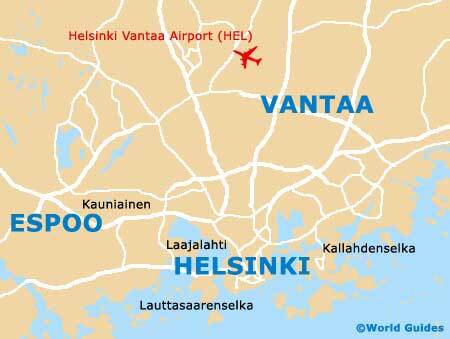 Finland's second-largest city is Espoo, although in reality it is encompassed by the sprawl of the capital Helsinki. Along with Vantaa and Kauniainen, this city merges with the Finnish capital along the Gulf of Finland, creating the greater metropolitan area. From its rural beginnings, the history of Espoo has evolved in the direction of science and technology. Today, this city is home to several of Finland's top tech start-up companies, as well as respected academic institutions such as the acclaimed Helsinki University of Technology. Archaeological evidence shows that people have been living along the Gulf of Finland where today's city of Espoo is located as far back as 9,000 years ago. The first permanent village, however, didn't get established until the 12th century, when the Kingdom of Sweden began exerting its influence on the region of modern-day Finland. The King's Road helped to put Espoo in the history books during the 13th century, when it was developed to handle the traffic in trade and mail. This was a major thoroughfare passing from Stockholm to Viipuri. The road connected several important towns and cities of the Middle Ages era, including Turku. Nowadays, visitors can still travel along the King's Road, and it has been extended all the way to St. Petersburg in Russia. The early centuries were perhaps the most prosperous in the history of Espoo. Buildings like the cathedral, which dates from the late 15th century, still stand in the city centre today. The Espoo City Museum is an ideal place to experience the story of this city as it made its way into the modern era. By the beginning of the 20th century, this was still a small rural community with less than 10,000 residents, almost three-quarters of which spoke Swedish. Nearly all of the city's population worked in agriculture during this period, with neighbouring Helsinki providing the urban and industrial scene. During the 1940s and the following decade, as in many other parts of Finland, Espoo began the shift from farming to industry. Its close relationship to neighbouring Helsinki certainly helped it grow, as manufacturing overflow from the capital made its way into Espoo, just minutes away along the coast. As more and more people began working here, the city transformed into a popular place to reside as well. The last half of the 20th century saw the city's population boom more than tenfold, rising from around 20,000 residents in 1950 to more than 200,000 at the turn of the New Millennium. The original cathedral remains the core of life in the city, with local historical significance being enhanced by the development of the centrally located Espoon Keskus administrative district and the Espoo Railway Station. Of note, it was only in 1972 that Espoo was granted full city status from the Finnish government. Today, the city boasts an ever-growing array of cultural and academic institutions, such as the Espoo Museum of Modern Art (EMMA), the Espoo Cultural Centre and the Helsinki University of Technology. Several of Finland's leading IT firms also have their headquarters around the city, including those of Nokia, Tekla and Kone. Although the vast majority of the residents speak Finnish, the city is officially bilingual thanks to the ten percent of the population that is of Swedish origin.